The bill rolls together familiar forms of Targeted Regulation of Abortion Providers (known as TRAP laws) with new and creative ways to punish women. Its most ghoulish piece of symbolism is the requirement that women pay for the cremation or interment of the aborted fetusa provision that also adds to the cost of the procedure, which is already prohibitive for many. The bill also mandates that women travel to a clinic for an ultrasound that involves listening to the fetuss heartbeata measure that Salon rightly calls pure intimidationand then travel back for the abortion after an 18-hour waiting period. 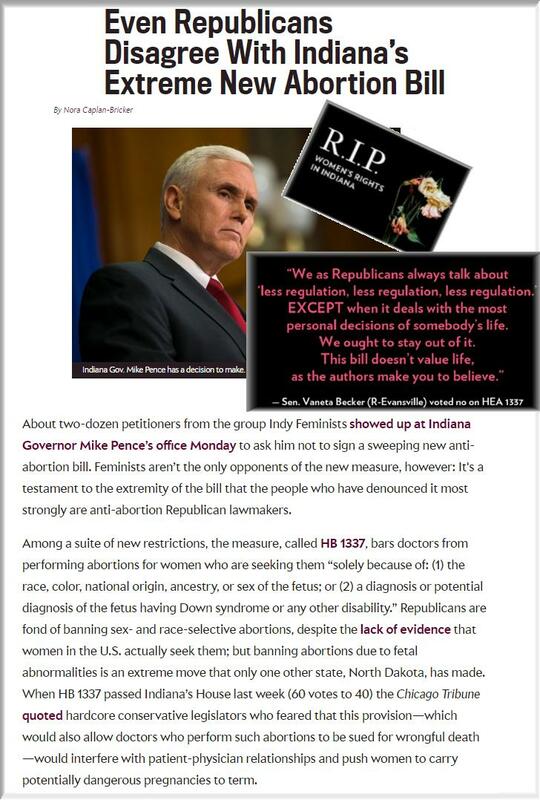 All this is made more difficult by the fact that clinics are operating in only four of Indianas 92 counties. The bill would likely cause more clinics to close with its requirement that abortion providers obtain admitting privileges at nearby hospitals; this formality has shuttered clinics across Texas, among other states, since hospitals are usually reticent about granting privileges to anyone who performs the controversial procedure.